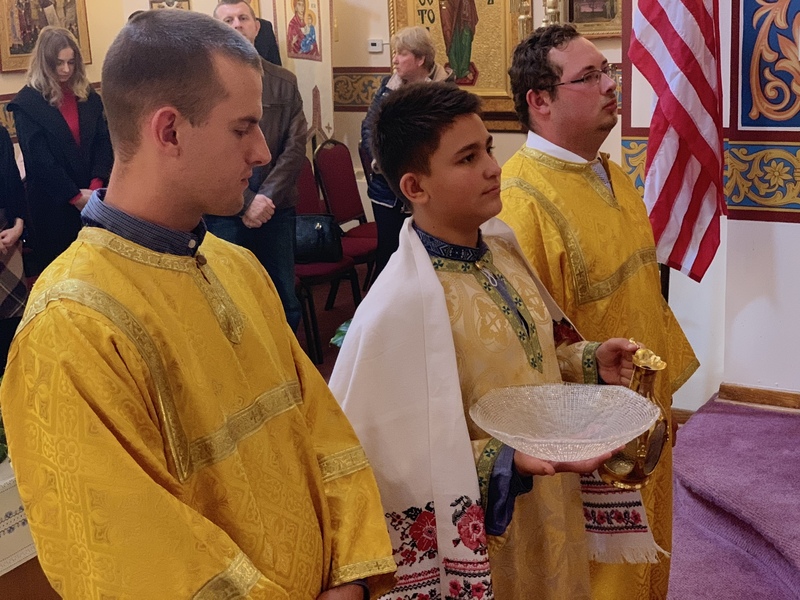 A cool breeze blew as the faithful began to arrive at St. Andrew Ukrainian Orthodox Memorial Church (South Bound Brook, NJ) for Sunday Divine Liturgy. As the clouds raced across the sky the last hydrangea blossoms of the season swayed to and fro in the wind, a flock of geese took flight, honking with excitement as they took to the air, answering an inner calling, and embarked on their journey. 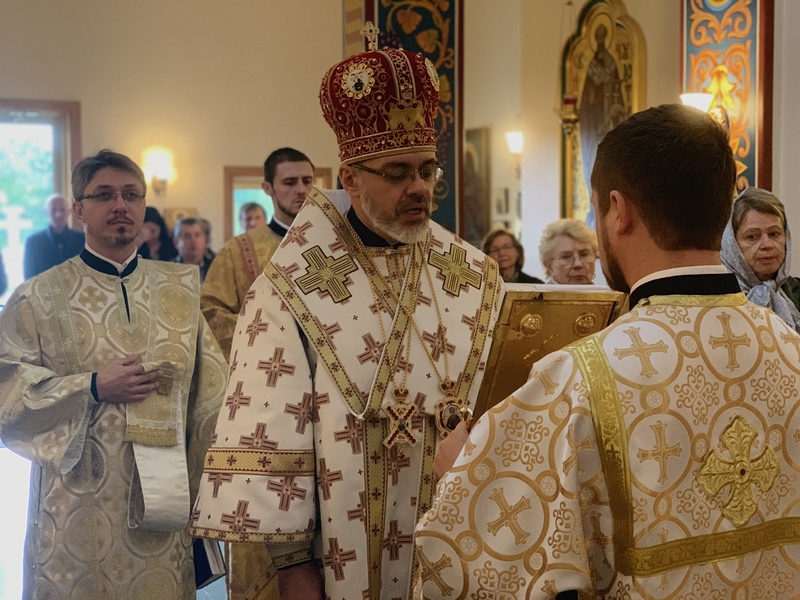 Today, Deacon Ivan Tchopko would be answering an even deeper inner calling and embarking on a life-long journey; for today, His Eminence Archbishop Daniel, spiritual father of the Western Eparchy of the Ukrainian Orthodox Church of the USA would be ordaining him to the Holy Priesthood. Inside the church the halos of the saints twinkled in the candlelight, and the Divine Liturgy began with His Eminence standing in the center of the Nave, surrounded by priests, deacons, seminarians from the St. Sophia Ukrainian Orthodox Theological Seminary, and by his flock, the faithful of the Ukrainian Orthodox Church of the USA. The day’s Reading was from the Gospel of Luke 7:11-16, retelling of the time when Christ resurrected the widow’s son. As Vladyka Daniel explained in his sermon, in that time period women had few rights. In order to even go to the market a woman needed to be escorted by a male relative. Therefore, this woman who was already a widow, and had greatly relied on her only remaining male relative – her son, had now lost him and found herself at a great disadvantage. She wept, mourning not only the loss of her child, but, wept in fear and hopelessness as she was now a woman alone. As the funeral procession exits the city, it collides with hope, and life, as Jesus Christ, along with his Disciples happens to be walking by. The Lord hears her weeping, and realizes her dire situation, and before she even asks for help, He has compassion on her and tells her not to weep. He reaches over to the casket and tells the young man to “arise”, which he does, and Christ returns a living son, and hope, to the widow. 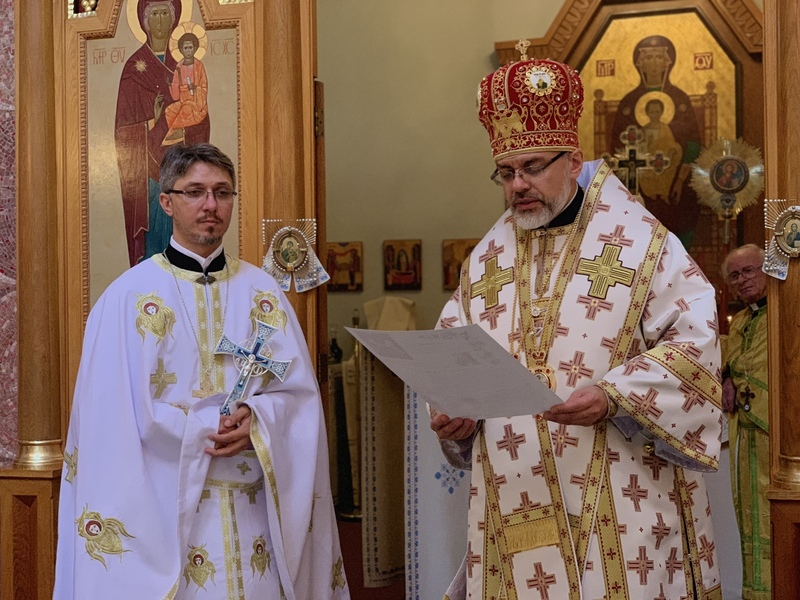 His Eminence Archbishop Daniel explained that today, as we will soon be witnessing the ordination of Deacon Ivan, we are to remember that we all are called to the priesthood. Each of us has a calling. While we are not all called to be priests in the Church, we are all nonetheless, called to be priests in our lives and help those around us. Anointed at our Chrismation we too have a responsibility and a role to play in life. Whether we toil in the kitchen, cooking, cleaning, so others can enjoy a meal; or whether we build things, or simply listen to others, we all have a vital role to play in the life of the Church and the world. We are all called to be the Light of Christ and to bring that Light to the darkened society. Vladyka Daniel asked that even when we feel discouraged or tired, we still need to shine that light, smile at others, offer assistance, encouragement and support. Everything we do, we must do for the love of Christ, and in an effort to help those around us. He reminded us not to live for ourselves, but, to live for others, and only then will we truly live, and be alive. 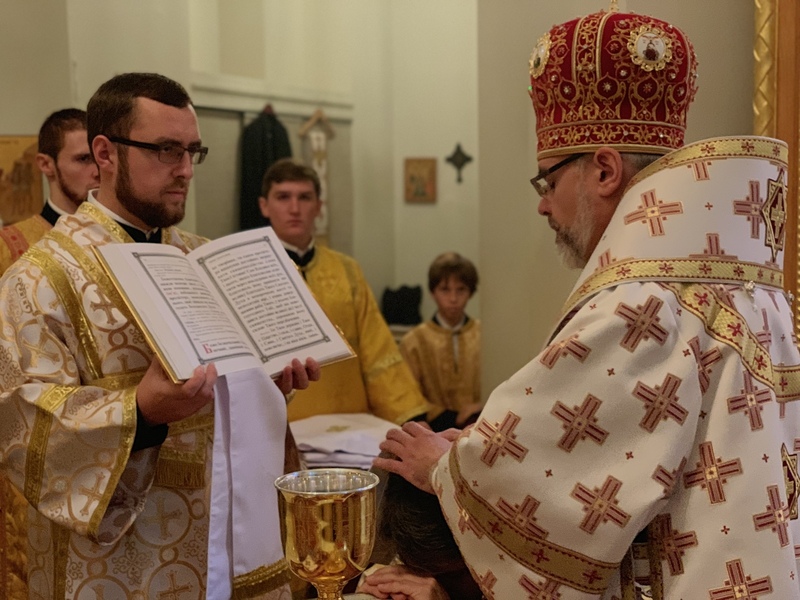 His Eminence continued by explain that later today once ordained to the priesthood, Father Ivan will be able to administer all the Sacraments, starting today with the Eucharist. 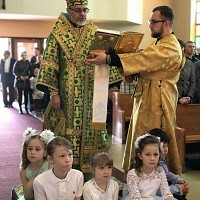 Vladyka encouraged those present to partake of Communion as often as they possibly can. 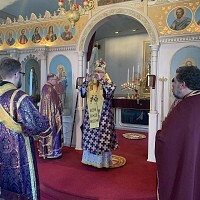 While many people claim that going to Communion once or twice a year will suffice, Vladyka stated that the benefit we reap from partaking of the Body and Blood of Christ is beyond explanation, and encouraged everyone to partake as often as possible. He asked that we do not deprive ourselves, or ignore the Lord when He offers us His Gifts. Vladyka continued by asking how a wife would feel if she cooked all day to prepare dinner for her family. Having set the table and lit the candles, she eagerly awaited the arrival of her loved ones. However, when they entered through the door they decided they weren’t hungry, or aid they would come down later. How must she feel? How does God feel when we reject His Gifts? Dwelling on their hierarch’s words, the faithful watched as Deacon Ivan censed the icons one last time as a deacon. 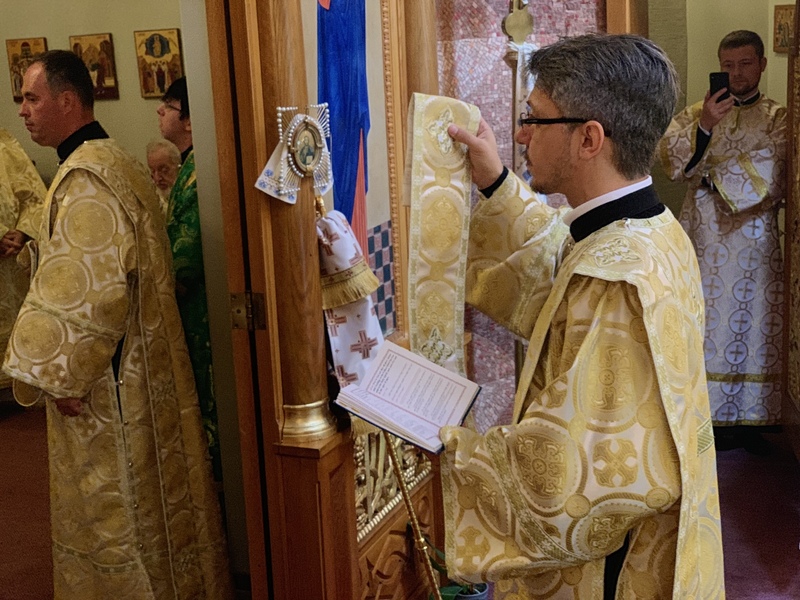 In preparation of the Great Entrance, the Aer which is the outermost cloth that covers the Chalice and Diskos, was removed and placed atop Deacon Ivan’s head as he exited the Altar, walked past the faithful and stood at the back of the church with his head covered. The Aer represents the swaddling clothes of the Christ Child, and later His burial shroud. The Gifts are covered by the Aer in preparation for the Mystical Sacrament of the Eucharist, and as such, the Deacon Ivan, a candidate for the holy priesthood, stood covered by the same veil that had just been covering the Gifts, in order to signify that he offers his life to the service of the Holy Mysteries of the Body and Blood of Christ. At the conclusion of the Great Entrance, two deacons exited the Altar and taking taking Deacon Ivan by the elbows, they lead him forward to the Altar. Stopping to make three prostrations along the way, Deacon Ivan finally arrived at the Royal Gates, where his escorts pronounced, “Command! 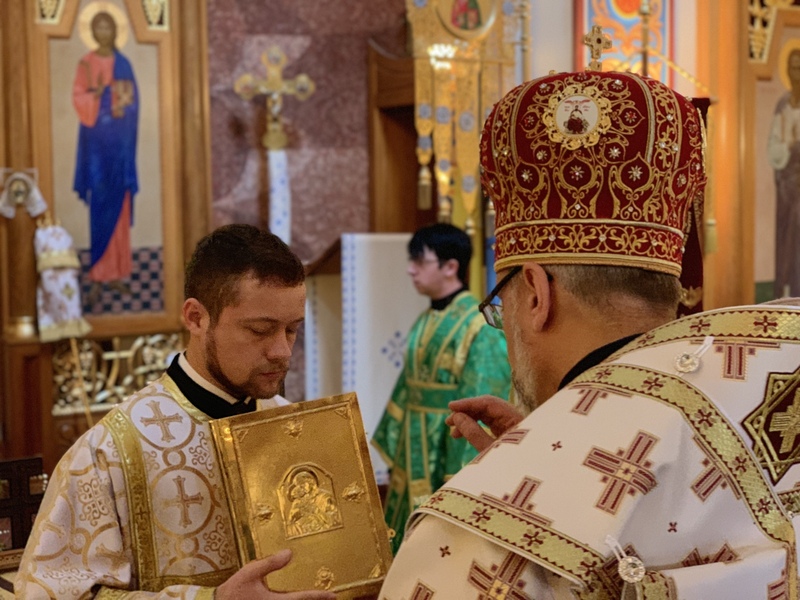 Holy Master, bless him who is before thee.” With these words the Aer was removed and placed once again over the Gifts which rest on the Altar Table, as the candidate was led around the table three times by priests, stopping to kiss each corner. 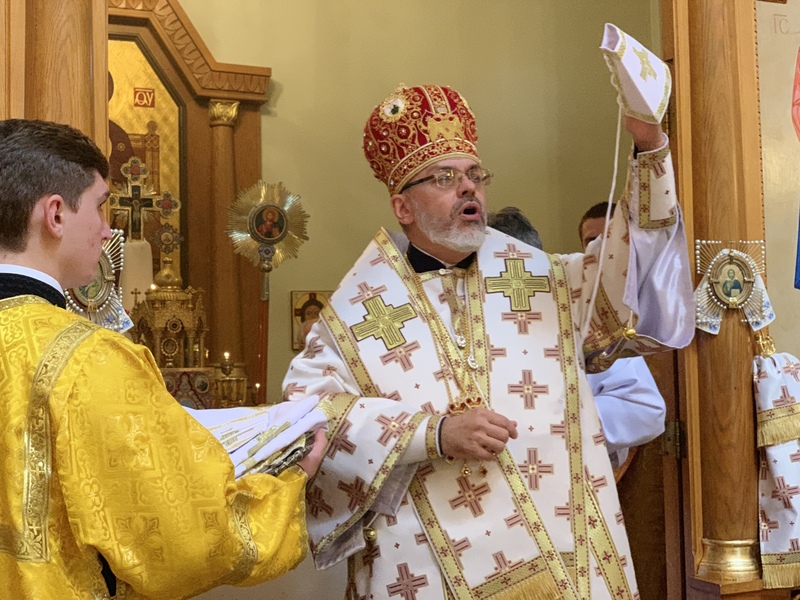 As they reached the Northwest corner, Deacon Ivan kneeled before the sitting Archbishop and kissed his Epigonation/Palitza, which is the diamond shaped cloth that hangs from his right hip, and denotes him as a "soldier" of Christ, and symbolizes the Word of God, fighting the wiles of the enemy. 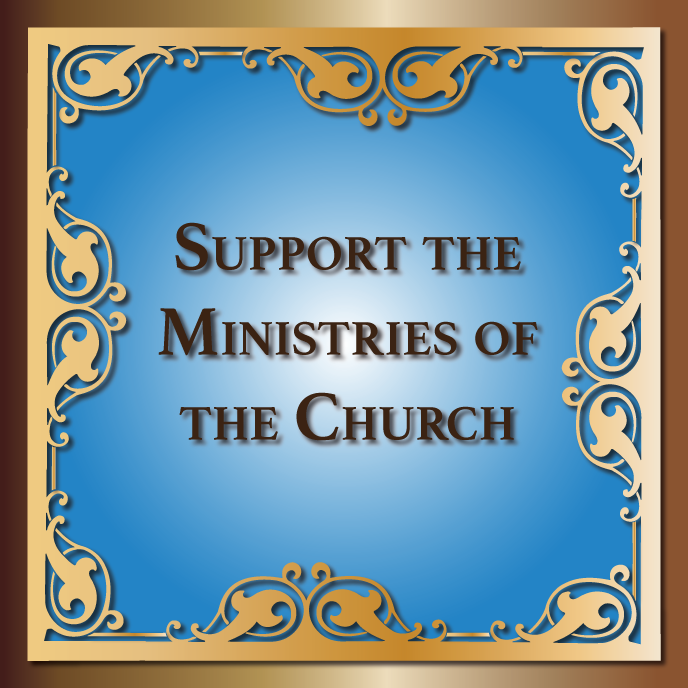 With three rotations completed, Deacon Ivan kneeled at the Southwest corner of the Altar table leaning his head upon his hands which rested on the table. Vladyka Daniel covered his head with his Epitrachelion and his right hand, as he read the Prayers of Cheirotonia over him. He then raised up Father Ivan and presented him at the Royal Gates to the faithful, exclaiming “Axios”, which means “worthy”. 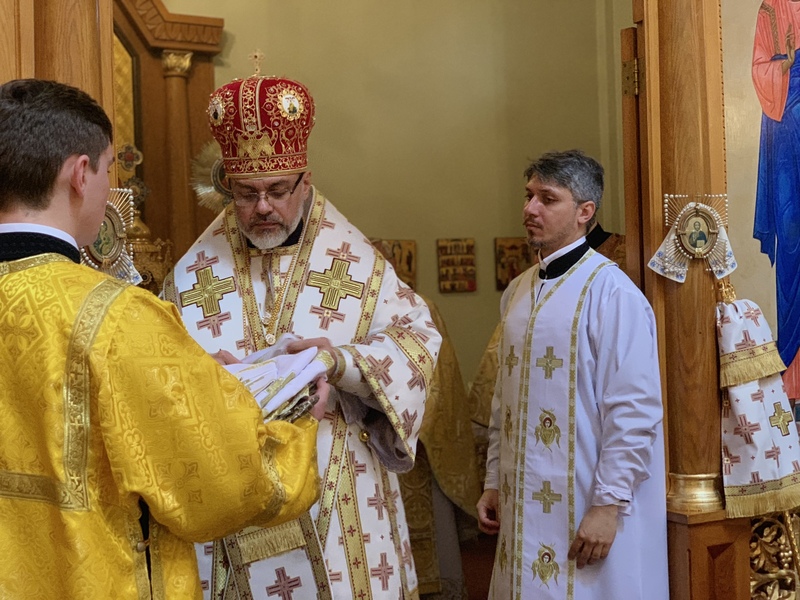 The hierarch then removed the deacon’s stole and presenting each item of the priestly vestments to the faithful proclaiming “Axios” and vested the new priest who was then presented to the public as Father Ivan. 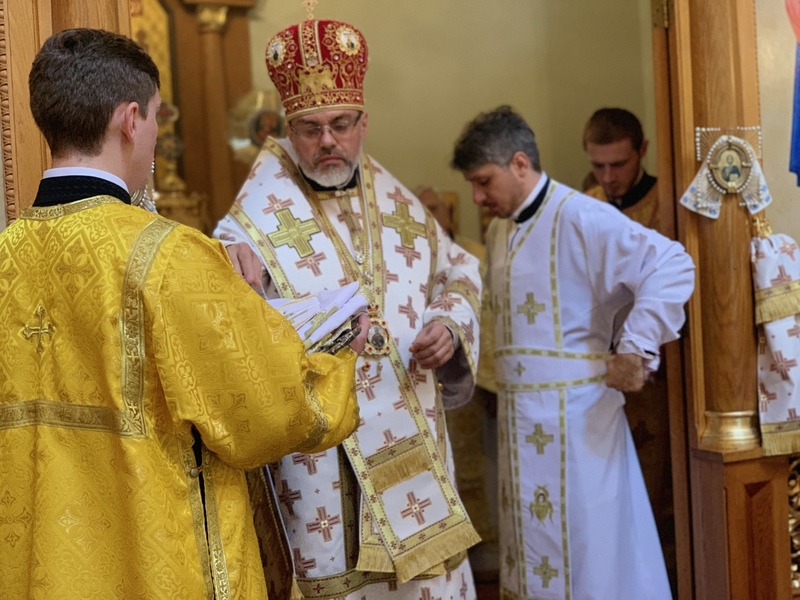 Vladyka Daniel took a moment to explain that Fr. Ivan’s family lives in Southern Brazil and have been watching the proceedings via FaceTime. His Eminence greeted the online family members, and explained to everyone that while it seems Fr. Ivan is alone here, he is surrounded by hundreds of faithful. 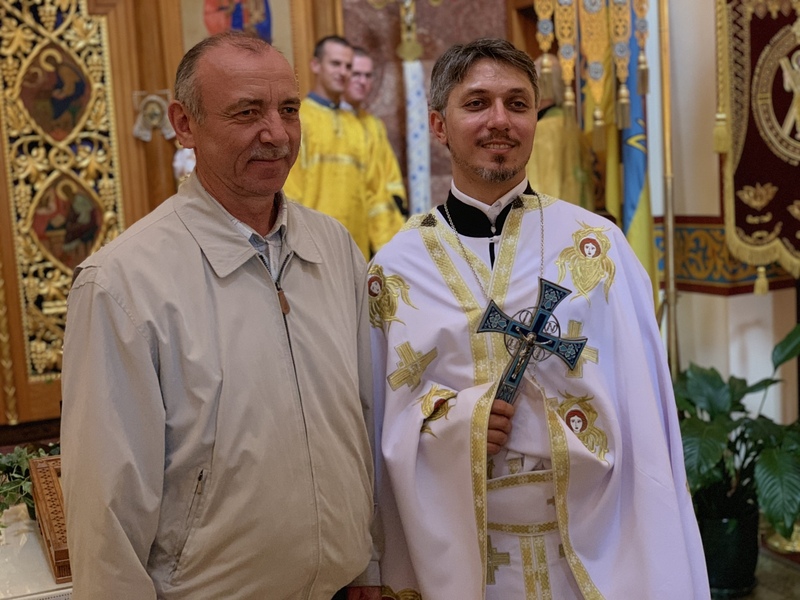 Vladyka explained that when single men are ordained their flocks become their families. Therefore, he asked that we all remember Fr. Ivan and all the clergy in our prayers, that Lord will guide them, protect them and bless them to carry out His work. 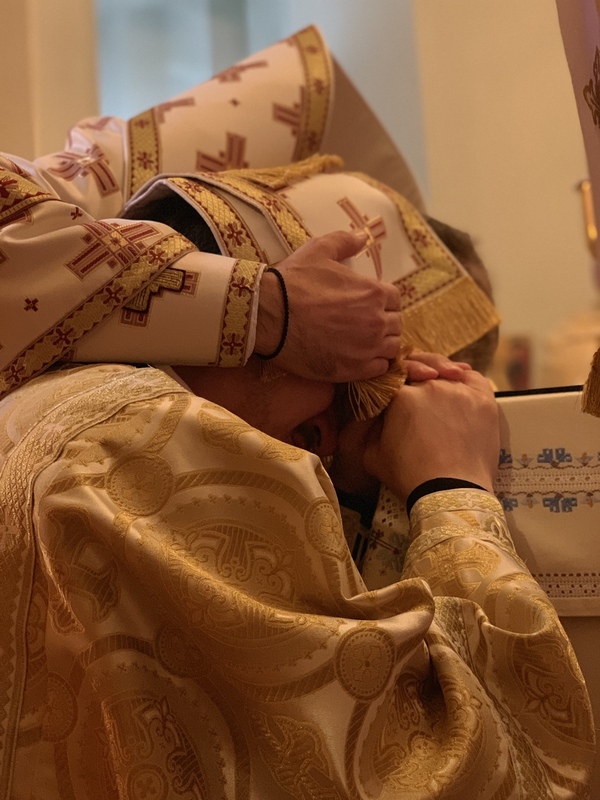 As the Liturgy continued, the newly ordained Father Ivan now picked up the Aer that had just covered his head, and waved it over the Gifts as His Eminence prayed with head bowed during the Creed. 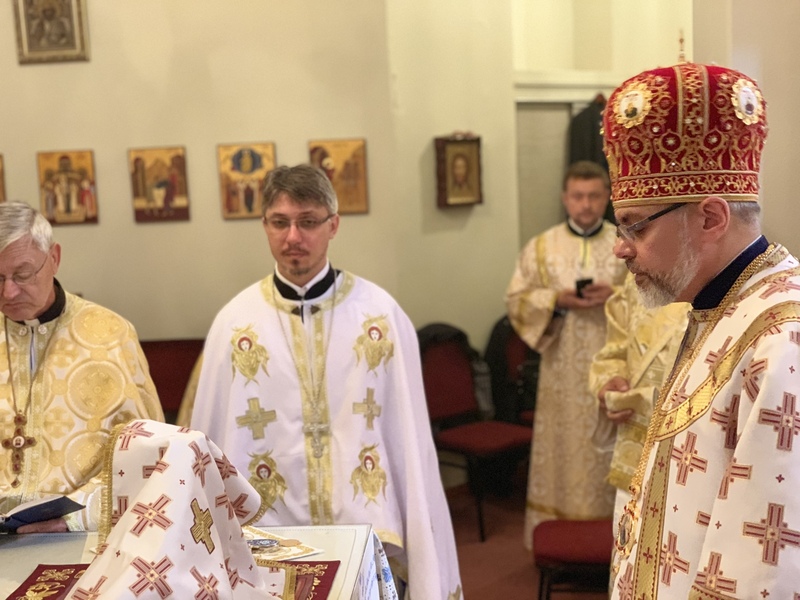 Thus the Divine Liturgy continued with the new priest shining in his new white vestments leading the way, supported by the senior clergy. 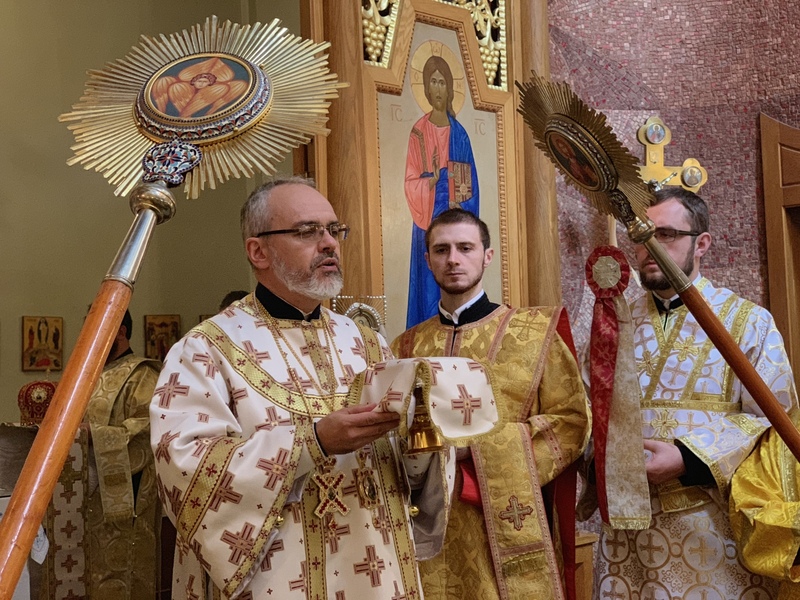 As the Royal Gates reopened, His Eminence handed the Chalice to Father Ivan who proceeded to offer Communion to the faithful who had lined up to receive the Gifts which the Lord had loving prepared and was offering to them. The Liturgy concluded joyously as everyone shuffled up to venerate the Cross which was offered by the newly ordained priest. Pausing to express congratulations, take photos and hug, the line slowly moved, affording everyone an opportunity to spend a moment with Fr. Ivan. 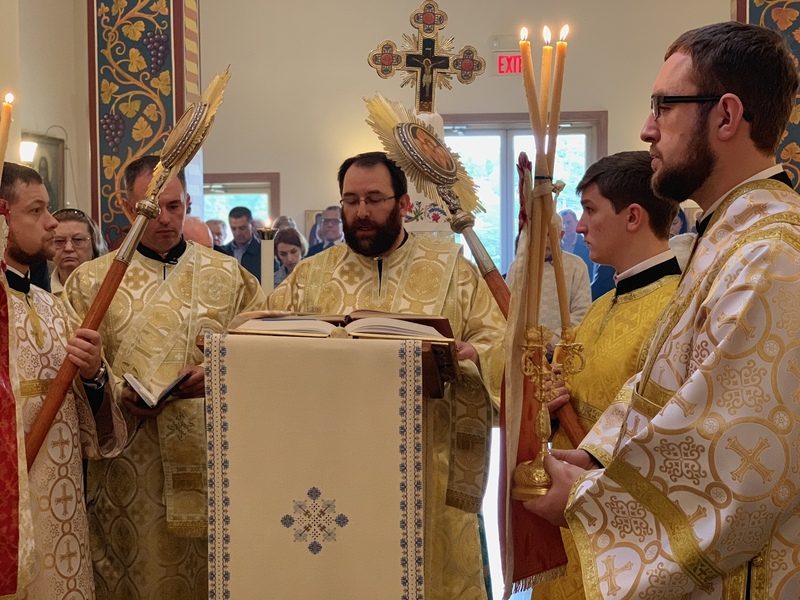 After the service everyone made their way to the St. Sophia Ukrainian Orthodox Theological Seminary of the Ukrainian Orthodox Church of the USA for a light lunch, and to spend some quality time together. As the day concluded and the visitors departed the Metropolia Center grounds they all left a bit more enriched, renewed by the Sacrament of ordination they had witnessed, they now carried a brightly shining light in their hearts out to the world beyond. 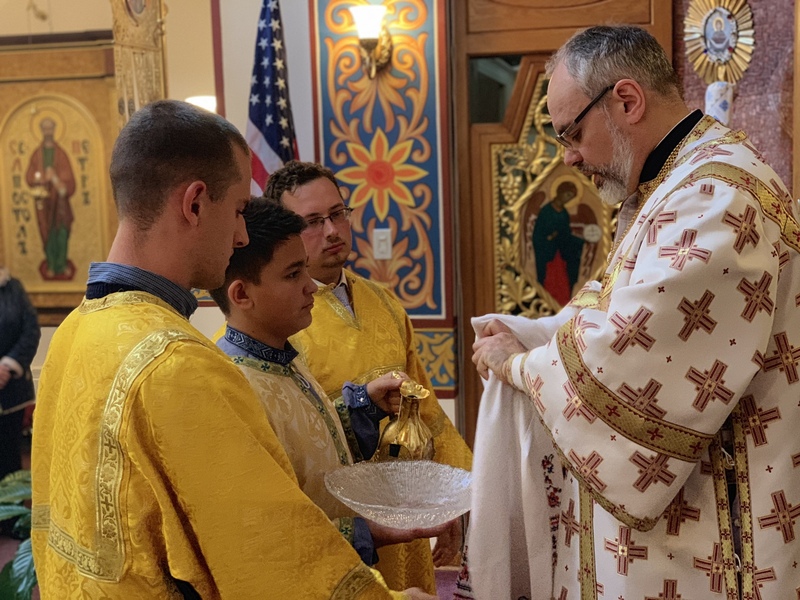 With final waves, the cars departed, but, the faithful promised to “meet” each night in prayer, and to remember the hierarchs and newly ordained Fr. Ivan Tchopko each night in their prayers.